The ‘Weaner management in northern beef herds’ manual is now available from MLA. This publication is free to everyone. This publication is a compilation of all the research, demonstration and practical knowledge available on weaning and weaner management in northern Australia. Weaning is a well-established practice and the emphasis in this book is two-fold: to describe best management practice for feeding and educating weaners; and to promote weaning of young light calves under difficult conditions to reduce mortality and improve fertility in the breeders. 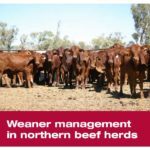 Download Weaner management in northern beef herds (PDF 3 MB). You can also join the principal author Russ Tyler as he discusses the best management practices for feeding and educating weaners and weaning young light calves under difficult conditions in a webinar held on 20 April 2012.